York Barbell Free Standing Adjustable Cable Crossover - The Adjustable Cable Crossover Machine by York Barbell is designed and built for use in commercial facilities including hotel fitness centers, school weight rooms and commercial gyms. The frame is constructed of 11 gauge steel for maximum strength and stability and fully powder coated to resist scratches and abrasions. 4,200 lb. capacity aircraft grade cables and sealed bearing pulley wheels offer long lasting strength, safety and smooth operation to the 200 lb. weight stacks for many years. And an integrated multi-angle pull-up bar allows members to perform pull-ups or use as an anchor for their favorite suspension trainer such as the CrossCore180. Add Low Row, Lat Pull-Down or Tricep Station to your York Cable Crossover: Want to add training versatility to your York Cable Crossover or make it the ultimate centerpiece of your facility? 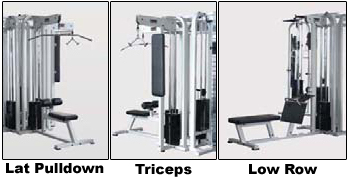 There are three optional stations that can be added one at a time or all three at once. Add the Lat Pull-Down or Low Row station to allow members to train their lats from all different angles. These two machines are the bread and butter for toning the back or adding muscle and strength. For the ultimate in tricep training, add the Tricep Station that includes a standing back pad for better form and concentration while performing tricep extensions. Optional Low Row Weight Stacks: 250 and 300 lbs. Optional Lat Pull-Down Weight Stacks: 250 and 300 lbs. Optional Tricep Station Weight Stack: 200 lbs. Optional Station Weights: Low Row = 540 lbs. | Lat Pull-Down = 487 lbs. | Tricep Station = 435 lbs.